When I graduated from college, I learned I was tens of thousands of dollars in debt. Here I was just starting out in life, yet I was heavily in debt and had to start paying right away. It was depressing and scary. So I feel for the people in this NPR piece who are struggling with student-loan debt. Some of them owe $80,000 or $100,000. While that’s excessive, the burden for paying for college is worse than when I was in school, and the price of education is still going up. It took me 10 years to pay off my school debt. I don’t regret going into debt for my education–getting a college degree is one of the best things you can do for yourself–but I could have owed much less if I had gone about things differently. 1. Pay Attention To The Loan Terms. Don’t just sign papers. Try to get loans that have low interest rates, or better yet, no interest rates–they do exist for student debt. Understands the terms of the loan: what are the monthly payments? What are the penalties if you don’t pay? How long can you defer payment after you graduate? It’s important to know what you’re paying for school, if for no other reason that it’s a motivator to do well in class. You certainly won’t want to pay for the same class twice. 2. Reconsider The Dorms. Let me put it this way: when I graduated from college, the vast proportion of my debt was from living in the dorms. Had I gone right to living in a house with roommates, as I did later in college, I would have had a LOT less debt to deal with. There are benefits to staying in the dorms, and many schools require you stay there your first year (although I find that rules are usually negotiable), but dorms are often overpriced for what you get. You may do better living off-campus, so do a cost comparison. 3. Cut The Meal Plan. Make sure you are paying for what you will actually eat. My first year, I paid for eating in the cafeteria three times a day when I really just ate there once. That was a waste of money. Also, consider feeding yourself–a microwave and a small fridge (if allowed in the dorms) may be cheaper than a meal plan. 4. Be Smart About Books. Textbooks are notoriously expensive, so don’t just buy them in the student bookstore. Shop around. Most college towns have bookstores that sell used textbooks for cheaper than the school, and there are websites that sell used textbooks for a fraction of the retail price. There are other options too–you can share a book with a classmate or get it out of the library, although this can be difficult and annoying during exam times. Another option, and this worked for me, is to wait until you get to the class to see what the professor actually uses. Many times, they will assign books that they barely glance at during the class, so wait to see what the syllabus says before purchasing. It can save a surprising amount of money. 5. Don’t Procrastinate. Late fees. Parking fees. Handing in student aid forms after the deadline passes. Not getting a scholarship because you didn’t apply in time. All these things have one thing in common: procrastination. And procrastination is expensive. I racked up hundreds of dollars in parking fees because I was too lazy to get the change I needed to pay the parking meters. Eliminating procrastination can save thousands over the course of a college education–and isn’t a bad policy for studying, either. So there are my tips. 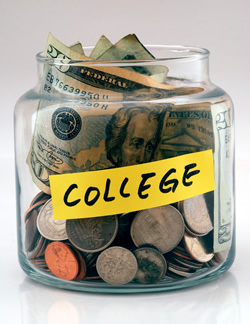 What tips do you have for saving money in college? I was quite an independent learner in college and if I had only known that there was something called a CLEP exam, I could have shaved a whole semester off of my college years. Basically, a CLEP exam is an exam that you pay a fee to take and if you receive a passing grade, you can opt out of taking the class in school. Of course, it is important to verify if CLEP exam credits are accepted at your school. If so, you can save the time and cost of commuting to and from class- as well as the actual exorbitant fees for taking the class at a university. Not to mention, not having to buy the required text book for your university (as they are constantly making very minor changes to each new required edition and bribing administrators with kickbacks from the textbook manufactures in order to drive out the used textbook business) Some might argue that CLEP takes away from the experience of college, but (take it from me) paying back loans takes away from your experience and enjoyment in life after college. We do not always need the “expertise” of a professor in all subjects. People are capable of learning on their own for soooo much less.